Upper right: spiny wood fern rhizome, held by Abe Lloyd as he explains the importance of the starchy food for First Nations in the area. Calvert Island. Photo by Kelly Fretwell. Upper left: Round sori on the underside of spiny wood fern. Photo by ES470 participant. Middle left and right: spiny wood ferns with false lily-of-the-valley growing underneath, on Calvert Island. Note several blades arising from single point. Middle left photo by Chanda Brietzke. Right photo by Julia Fisher. Lower left photo by Ian Cruickshank. Spiny wood fern is a fairly large fern that can be tricky to identify due to its similarity to other species in the region. The blades of this species are erect and spreading, growing up to 1 m (3') in length, in clusters from a scaly rhizome. The fronds of spiny wood fern are triangular in shape (lower right, middle left photos). The sori are round, pale green and located on the underside of the leaflets (top left photo). The sori house the sporangia, which produce spores for reproduction. The leaves are three times pinnate - meaning that pinnate leaflets are again bipinnate. 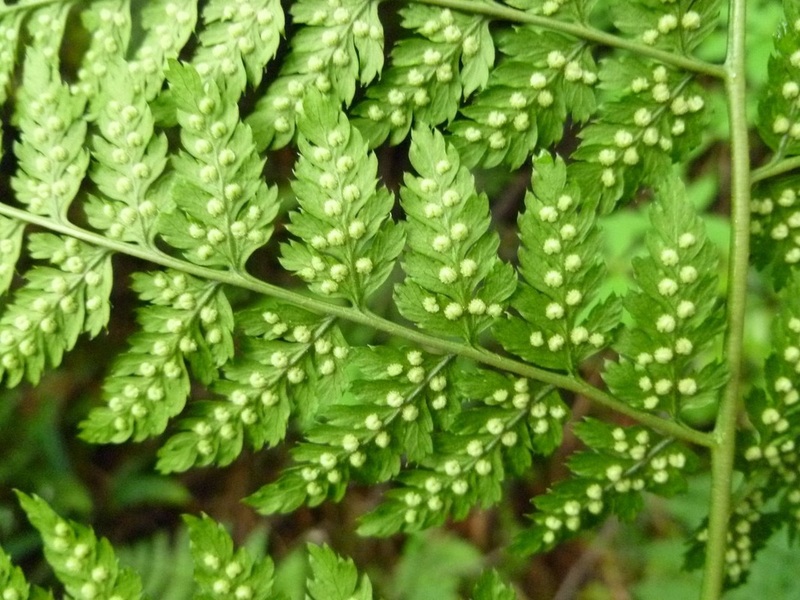 Spiny wood fern grows in numerous habitats, including moist forests, forest margins and clearings, as well as on scree slopes from low to subalpine elevations. This species is found throughout BC, California, and inland in the northwestern United States. It is also found in Greenland, eastern Canada, northeastern USA, and in parts of Eurasia. 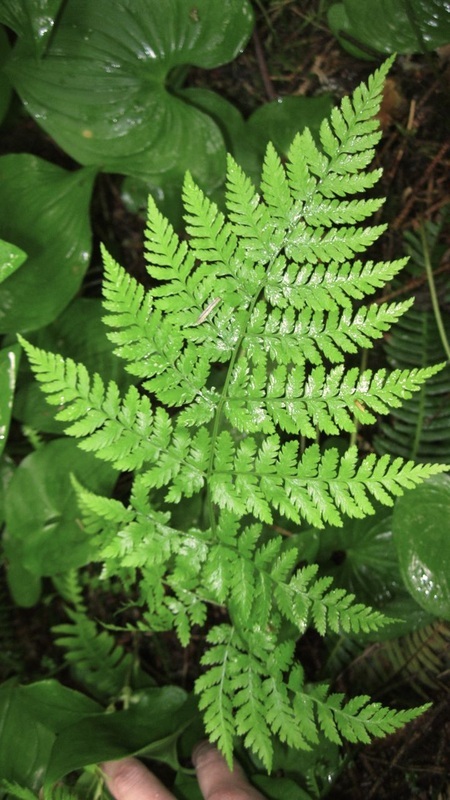 Spiny wood fern can be mistaken for both bracken fern (Pteridium aquilinum) and lady fern (Athyrium felix-femina ssp. cyclosorum). Bracken fern grows as solitary fronds connected by an underground rhizome, and not a clump like spiny wood fern. Like spiny wood fern, lady fern grows in clumps. However, lady fern blades taper at both ends, giving blades a diamond shape, whereas spiny wood fern blades are tapered at one end, giving blades a triangular shape..
Other similar species include the male fern (Dryopteris filix-mas), which is 1-2 times pinnnate, and the coastal wood fern (Dryopteris arguta), which is not typically found as far north as BC's Central Coast. 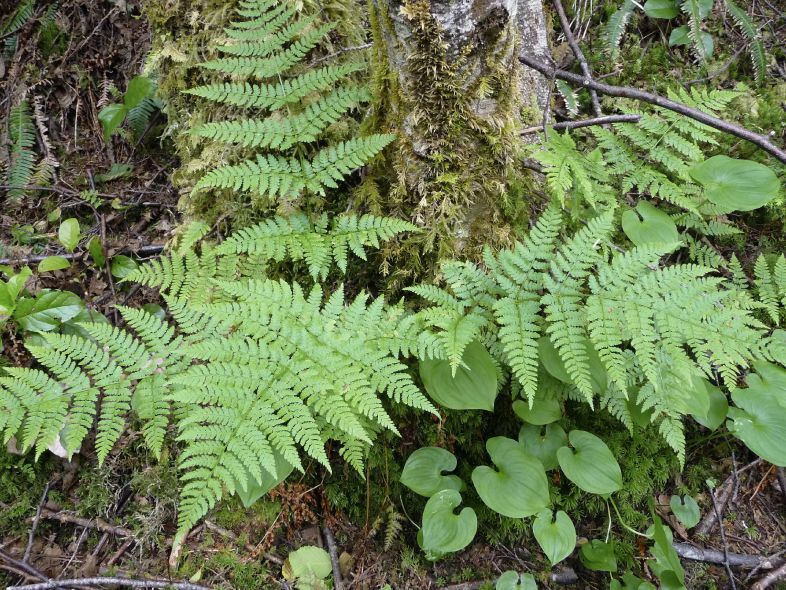 Toothed wood fern (Dryopteris carthusiana) is a circumpolar species found infrequently throughout BC. Its pinnae do not taper as abruptly as those of spiny wood fern. The rootstock of the spiny wood fern has a pineapple-like appearance, and was an important starchy staple for many First Nations in Coastal BC, including the Wet'suwet'en, Gitxsan, Tsimshian, and Haisla. The roots were gathered in the fall or winter and some Wet'suwet'en Elders remember the flavour fondly, referring to these roots as their 'potatoes'. 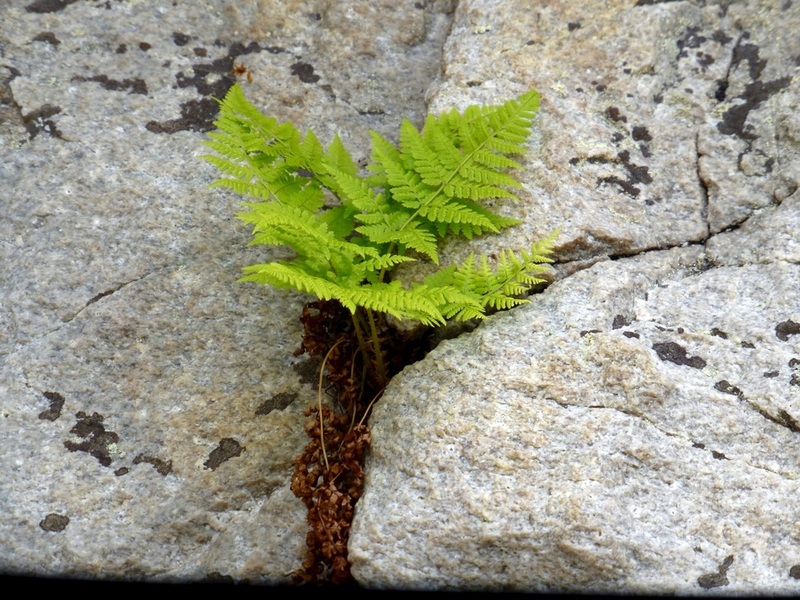 Dryopteris expansa (C. Presl) Fraser-Jenkins & Jermy. spiny wood fern; spreading wood fern; spreading woodfern. In Klinkenberg, Brian. (Ed.). E-Flora BC: Electronic Atlas of the Plants of British Columbia. Lab for Advanced Spatial Analysis, Department of Geography, University of British Columbia, Vancouver. Accessed on 12/13/2013. Dryopteris expansa (C. Presl) Fraser-Jenkins & Jermy spreading woodfern. USDA Plants profile. Accessed 06/04/2013. Gottesfeld, L. M. J. (1994). Wet'suwet'en Ethnobotany: Traditional Plant Uses. Journal of Ethnobiology, 14(2):185-210. Beatrice Proudfoot, Chanda Brietzke and Brian Starzomski (2013).